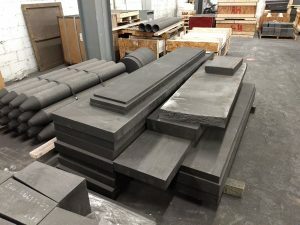 Ameri-Source Specialty Products offers a variety of different sizes and shapes of graphite block, rounds and rods to suit many different applications and customize components and parts for specific requirements. Our comprehensive on-site inventory and technical manufacturing expertise allows us to take on new product development from new and existing customers. We work closely with all of our customers by understanding their needs and transforming that need into the required products. Through our global partnerships, we can provide the best materials at the best price along with shorter lead times and quick turnarounds. Graphite rounds are popular in the creation many different types of molds: hot pressed, static casting, centrifugal casting, fused refectory etc. They are also used to create different furnace parts such as resistance heating elements, induction susceptors, structural elements, charging plates, furnace liners, heat shields and covers. Rounds are also used as anodes for the electrolysis of metals, cathodes in the aluminum electrolysis cells and more. Boats and trays can be machined for sintering along with crucibles for melting and reduction. Ameri-Source can also machine parts for heat exchangers out of rounds. 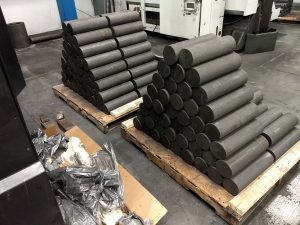 Graphite rods or electrodes are manufactured with high quality raw material including petroleum cokes, needle cokes and coal tar pitch through the production process of calcining, crushing, burden, mixing, kneading, extruding, baking, impregnation, graphitization, manufacturing and packing. Graphite electrodes are widely used in electric arc furnaces and ladle refining furnaces for steel making and used in electric smelting furnaces for producing industrial silicon, yellow phosphorus, corundum, nonmetals and more. Graphite block is made form the domestic petroleum coke and widely used in the metallurgy, machinery, electronics and chemical industry, etc. Block include molded, extrude, vibrated and isostatic. Our main and most preponderant graphite block is molded formed. Our products own the following characteristics: low electric resistance, good electric and thermal conductivity, high oxidation resistance, greater resistance to thermal and mechanical shock, high mechanical strength, high machining accuracy and so on.